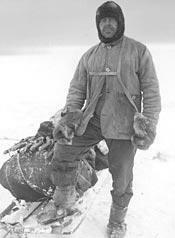 A Royal Navy officer and explorer who led two expeditions to the Antarctic regions: the Discovery Expedition, 1901–04, and the ill-fated Terra Nova Expedition, 1910–13. During this second venture, Scott led a party of five which reached the South Pole on 17 January 1912, only to find that they had been beaten by Roald Amundsen's Norwegian expedition. On their return journey, Scott and his four comrades all perished from a combination of exhaustion, starvation and extreme cold.